Writer for This Unit: Elvin J. Parker III is a member of the African American Lectionary team. 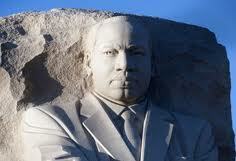 The unit you are viewing, Dr. Martin Luther King, Jr.’s Birthday (Beloved Community Day), is a compact unit. This means that it is not a complete commentary of the Scripture(s) selected for this day on the calendar, nor does it have a full, supporting cultural resource unit and worship unit. Instead, to enliven the imagination of preachers and teachers, we have provided a sermonic outline, songs, suggested books, and suggested articles, links, and videos. For additional information, see Dr. Martin Luther King Jr.’s Birthday (Beloved Community Day) in the archives of the Lectionary for 2008, 2009, 2010, and 2011. 2011 was the first year that the African American Lectionary posted compact units for moments on its liturgical calendar. Dr. Martin Luther King, Jr. was one of the most influential leaders in recent world history. Still, the idea of a United States holiday recognizing his life and legacy sparked considerable controversy. In 1986, through the heroic efforts of his wife, Coretta Scott King, and other Civil Rights activists, former President Ronald Reagan declared the third Monday in January “Martin Luther King, Jr. Day,” the only federal holiday commemorating an African American. For any momentous period of change there are many participants, but history typically only remembers the names of certain key leaders. Even in this struggle for civil rights, there were numerous willing “foot soldiers” for freedom who came before Dr. King; there were those who walked alongside him, giving their witness and energy to the Civil Rights Movement; and there are those continuing this work today. Many of these “foot soldiers” were, and are, even younger than Dr. King, who was only 26 when destiny propelled him to the forefront of the struggle. For all of Dr. King’s importance, we must remember that he did not invent the movement. He inherited it, as do today’s foot soldiers. With this material as our backdrop, we provide a sermonic outline for Dr. Martin Luther King Jr.’s Birthday (Beloved Community Day). (v. 8) But you are not to be called rabbi, for you have one teacher, and you are all students. (v. 9) And call no one your father on earth, for you have one Father—the one in heaven. (v. 10) Nor are you to be called instructors, for you have one instructor, the Messiah. (v. 11) The greatest among you will be your servant. (v. 12) All who exalt themselves will be humbled, and all who humble themselves will be exalted. There is a distinction in the social sciences between power and authority that I suspect comes straight from the Bible. Power—The ability to compel compliance to the leader’s will, even against the will of followers. Authority—The strong inclination by others to submit their will to the will of the leader out of a firm belief that the leader is acting in the followers’ best interest. The one who leads based on power loses authority. People come to trust such a leader less, which requires the exercise of more power to gain compliance. Generally, the less one uses power in leadership to gain compliance, the greater becomes their authority. The one who leads based on authority must occasionally resort to the use of power for the greater good of the persons affected. However, as just stated, a reliance on power will destroy authority. The more one is able to lead by authority the less the need for exercising power. Today marks the 83rd birthday of the late Reverend Dr. Martin Luther King Jr. It is also the 26th year that the United States of America has observed this day as a Federal Holiday. The amplitude and far-reaching impact of this cosmopolitan citizen was so significant that over 100 countries also recognize this day as a time to remember his teachings and to reflect upon his philosophy of world peace. c. Adhere to God’s call to serve. c. Servants are admonished to be humble or suffer being made humble. c. Actualize God’s love through serving others. Jesus’ dictum—to be great one must be a servant, to be a servant one must be humble—appears almost impossible to follow. If you are puffed up with self-pride, you will be brought low. My, what a difficult word to hear! Yet, it is an altogether fitting admonition filled with experiential wisdom. I say, “experiential wisdom” because Jesus does not just spew words into the air. He lived those very words. By word and deed he gave us an example of servant-leadership marked by humility seasoned with grace. It was a humility that was the foundation of his greatness. He came to us not as a regal royal in a palace, but as a Messiah born in a barn in the backstretches of Bethlehem. His education was forged by the existential reality of the common and the poor. He was the son of a meek and humble carpenter. He walked the hot dusty roads of Galilee and the rough and rugged terrain of Judea. His was an attitude of self-giving. He demonstrated his love and compassion for others by means of mercy and sacrifice. We who claim to be followers of the Savior are also called to self-sacrifice. The path to greatness for God is blazed in the belief that as God loved us so must we too love others. And our love for others is fueled by our willingness to humble ourselves and serve unselfishly with joy. We cannot claim the pinnacle of greatness unless we begin at the grassroots of total submission to the will of God. That is what Jesus meant when on that doleful night before his death in the Garden of Gethsemane he exclaimed in anguish, “Never-the-less, not my will, but thy will be done!” He subjected himself to his foes, that wicked coalition of Jewish politics and Roman subjugation. They whipped him all night long. Cursed and spat on him. Mocked him and then took him to Dead Man’s Hill and crucified him! He lowered himself by being raised on a cross. But early Sunday morning, before the dew drops of the morning kissed the virgin white lips of the lily, he shook down a dying garment and stepped out on resurrection ground because had exalted him! I tell you because it is an eternal truth that if you humble yourself, God will bless your humility and reward your sacrifice with an indomitable greatness. His promises are sure and his word is secure: if you want to be great, then be a servant! The great violinist Niccolo Paganini willed his marvelous violin to the city of Genoa on condition that it must never be played. The wood of such an instrument, while used and handled, wears only slightly, but set aside, it begins to decay. Paganini's lovely violin has today become worm-eaten and useless except as a relic. A Christian's unwillingness to serve may soon destroy his capacity for usefulness. See the Sermon Illustrations section of the African American Lectionary for additional illustrations that you may wish to use in presenting a sermon for this moment on the liturgical calendar. Colors: The color of the clothing worn by servants. See the attached “Special Music & Worship Resources for Martin Luther King Jr.’s Birthday (Beloved Community Day)” prepared by Michelle Riley Jones. Click Here. “Why (The King of Love Is Dead)” was written by Nina Simone. In her typical queenly and riveting style, she wrote what many were thinking about but could not eloquently articulate after Dr. King died. “The Drum Major Instinct,” 10 minutes of the 20-minute sermon delivered by Dr. Martin Luther King Jr., February 4, 1968, at Ebenezer Baptist Church in Atlanta, GA.
A pictorial tribute to Dr. Martin Luther King Jr. set to the track of “Happy Birthday” by Stevie Wonder. For churches and other groups with screens, use images from famous speeches given by Dr. Martin Luther King Jr. These can be found by searching the phrase “speeches of Dr. Martin Luther King, Jr.” on www.google.com. This is a wonderful piece to show to your children and youth groups about the journey of the Chicago Children’s Choir as it explored the Civil Rights Movement. “A Dream,” by Common and Will.I.Am, from the film Freedom Writers. “In the Name of Love,” by Bono of U2, as sung by the Soweto Gospel Choir. “In the Name of Love,” performed by U2. Project PowerPoint slides that contain the 2012 King Day theme. Also, incorporate civil rights/MLK images as the background on the slides, and/or the slides can include Scripture references. Downloadable art images of Martin Luther King Jr. can be found online at http://www.newsart.com/x1/x529.htm. The Newsart.com website provides art and drawings by nationally and internationally syndicated artists whose work has appeared in Newsweek, Time, the Boston Globe, the Washington Post, and many other of the world’s most respected publications. Hold a “gospel sing” or “singspiration,” and intersperse MLK reflections with the songs/singing. Below are several reflections by noted theologians and contributors to the African American Lectionary. A Reflection by Rev. Dr. Kenneth Robinson, MD, Senior Pastor, St. Andrew's AME Church, Memphis, Tennessee, and Tennessee State’s first African American Commissioner of Health. Highlight the biography of at least one person involved in the civil rights movement (in the 60s or modern-day), focused on the 2012 MLK Jr. Day theme. Present a brief (2-3 minutes) bio on such individuals. Dyson, Michael Eric. I May Not Get There with You: The True Martin Luther King, Jr. New York, NY: Free Press, 2001. King, Martin Luther, and James Melvin Washington. A Testament of Hope: The Essential Writings and Speeches of Martin Luther King, Jr. San Francisco, CA: Harper San Francisco, 1991. Brooks, Gwendolyn. In Montgomery: And Other Poems. Chicago, IL: Third World Press, 2003. Baldwin, Lewis V. To Make the Wounded Whole: The Cultural Legacy of Martin Luther King, Jr. Minneapolis, MN: Fortress Press, 1992. 1. For more information, consult http://www.thekingcenter.org/the-king-holiday/ accessed 29 August 2011. 2. Michael Kruse, Chair, General Assembly Mission Council of the Presbyterian Church (USA). October 05, 2005, Kruse Kronicle: Power, Authority, and Leadership in the Body of Christ. Online location: www.krusekronicle.com/2005/10/power_authority.html accessed 29 September 2011.